Tile flooring is a perfect choice for kitchens, bathrooms, basements, porches, laundry and all other moisture-prone rooms. In fact, discount tile flooring is extremely durable, water resistant and easy to care for compared to other flooring options. Porcelain tile flooring is a type of tile flooring that is characterized by being stronger, more pure and harder than other kinds of tile flooring options available. Porcelain tile installation, with inherent versatility, gives the opportunity to have some benefits with a variety of architectural surfaces. When it comes to water, porcelain tile flooring outperforms all types of flooring. The density of porcelain makes it more resilient to water. Porcelain tile installation can be done with application of melted glass glaze, which makes it more impervious to water. Being able to repel water makes porcelain tile flooring naturally a stain-resistant material. Porcelain tile can be nearly impossible to stain, scratch and be affected by all other types of wear and tear. Porcelain tile flooring absorbs very little moisture, so spills and stains can be easily wiped out with a damp cloth. Discount tile flooring stores suggest that porcelain needs to be cleaned with water or mild detergent and can look good with minimal effort. From a rough stone look to sophisticated selections, Express Flooring offers lasting design solutions for both residential and commercial purposes. Porcelain tile installation can be done in full range of styles, designs, sizes, finishes and colors with innovative borders, accent and pattern options. Moreover, discount tile flooring provides you with endless possibilities in porcelain tiles for indoors and outdoors. If porcelain tile installation is done properly, it can last for decades. It has the capability to withstand rigors of daily living and maintain its beauty for generations. 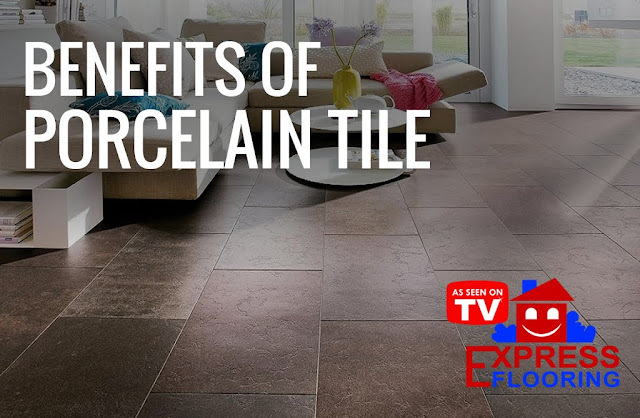 Porcelain tile not only is an ideal choice for homes and business spaces, but it also increases the value of your property. Express Flooring offers porcelain tiles that can add flawless beauty, function, and style to all residential and commercial environments.